Heading into the weekend, there is nothing better than an old stand-by party dip to kick of your Friday night. This recipe is not only incredibly yummy, it can easily incorporate some of those healthy leafy greens from your garden. NOTE - I am not suggesting this is a healthy recipe, but it does have some healthy components. You'll notice that I decided to use some lighter versions of the ingredient list rather than load it up with the full amount of fat and calories that I could have. Did anyone know the difference? Absolutely not. In fact, I won't ever make it with anything but the lighter options. I should mention that the inspiration for this aaaaamazing appetizer came from our latest CSA box. Step one: Gather the ingredients. Saute the onion, chard stalks and kale leaves in olive oil. Add the garlic and saute a couple more minutes. Don't forget to stir frequently. We aren't looking for browned veggies here, just softened! Step two: Add the good stuff. Enter - cream cheese, sour cream, mayo and Parmesan. Oh yeah...and the Worcestershire. Don't forget that. It adds quite a kick to the flavor that you won't want to go without. Step three: Garnish with scallions and serve with bagel chips, veggies, tortilla chips or bread. YUM! HOT SWISS CHARD-KALE ARTICHOKE DIP | Yield: enough for a party (around 12-15 servings) | Total Time: 25 min. *NOTE: Total, I used about 3-4 cups worth of greens. They wilt down when cooked, so don't be alarmed at what seems to be a lot of green. You could use all Swiss chard, all kale, or even just regular spinach. Choose your dark leafy green of choice! Heat olive oil in a large soup pot. Add onion, chopped Swiss chard stalks, and torn kale leaves. Cook 5-7 minutes, stirring frequently. Add minced garlic and cook 2 minutes, stirring regularly to avoid browning. Add Swiss chard leaves and chopped artichoke hearts into pot. Cover and cook, stirring occasionally, until chard is tender, about 5 minutes. Remove lid for the last few minutes to evaporate any excess liquid in the pot. Stir in cream cheese, sour cream, mayo, shredded Parmesan and Worcestershire sauce. Cook 10-15 minutes, stirring occasionally until dip is hot and thickened. Add salt and pepper to taste. Serve warm, garnished with chopped scallions or chives. More birthday celebrations! This time it was mine. T surprised me with some beautiful flowers, and we enjoyed a quiet evening out at one of our new favorite lakeside eats. If you appreciate an excellent view, great atmosphere and a gourmet menu, take the time to check out the new Restaurant 1856 in the Emporium in Arnold's Park. We've been twice now, and have no complaints. A note: You're going to need a reservation, and you need to call in advance a couple days for a prime window spot. New boat! With most of my family in town last week, it was decided that our old boat wasn't going to do the trick anymore in terms of size, power, or ease of use. After much negotiating, my Grandpa surprised us all with an upgrade to our lakeside ride. This is a picture of the new hoist getting installed. Quite the production! 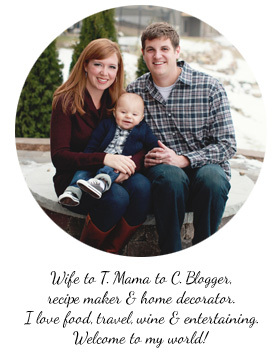 T and I are most looking forward to many wonderful boat picnics in our future. Mmmmmm tarragon. Not an herb that is used a great deal in our kitchen, T & I were excited to find a giant bunch in our CSA box this week. After looking around for some inspiration, I landed on a picture-less recipe from one of my favs, Giada de Laurentiis, on FoodNetwork. The woman knows her way around a kitchen. Don't trust me? Try some of her recipes. I have yet to try one I don't like. 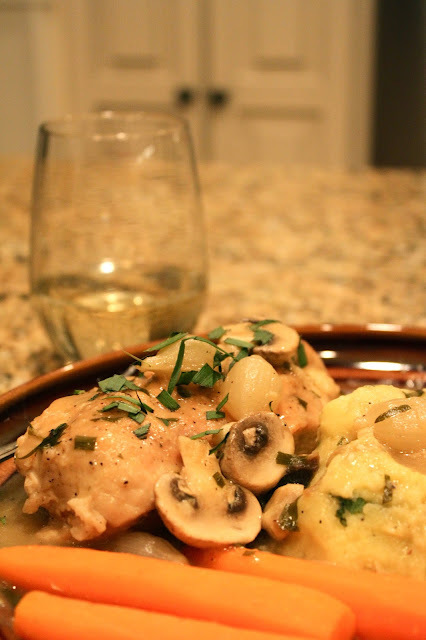 This tarragon chicken with pearl onions and mushrooms evokes the flavors of Thanksgiving when served with mashed potatoes and steamed carrots as a side. If you're not feeling the chicken, the gravy by itself is phenomenal. DON'T leave out the pearl onions. They add a wonderful sweet surprise and the gravy is delicious spooned over warm mashed potatoes. Step One: Gather the ingredients. Good news is that this recipe only requires a small amount of wine...but an open bottle is an open bottle...you may as well pour yourself a glass...or even two! Step Two: Season the chicken with salt and pepper and dust with flour. Cook in a skillet with olive oil, turning occasionally for approximately 8 minutes. Remove to a warm plate and tent with foil. Step Three: In the same skillet, add the onions and garlic. Cook for 5 minutes, add wine and return chicken to skillet. Add tarragon and chicken broth bringing to a boil. Lower heat, simmering 30 minutes, turning chicken every 10 minutes until cooked through. After 30 minutes, remove chicken to a plate and finish the sauce before serving. TARRAGON CHICKEN WITH GREEK MASHED POTATOES | Yield: 6 servings | Total Time: 1 hr. 15 min. In a large saucepan, heat oil over high heat. Season the chicken with salt and pepper, to taste, and dust with flour. Cook the chicken, turning occasionally, about 8 minutes. Transfer chicken to warm plate and tent with foil. Heat the same pan used for chicken over medium-high heat. Add the onions and garlic, season with salt and pepper to taste. Cook, stirring frequently, about 5 minutes or until softened. Increase heat to high and add wine, scraping browned bits from the bottom of the pan with a wood spatula. Return chicken to the pan, add 3 C broth and 1/2 C chopped tarragon, bring to a boil. Reduce heat to a simmer, cover the pan and cook 30 minutes, turning chicken every 10 minutes. Transfer the chicken to a warm plate tented with foil before finishing the sauce. To finish the sauce: Whisk together 1/3 C chicken broth and flour in a small bowl. Add to saucepan, whisking to combine. Brink sauce to a simmer and cook uncovered, about 10 minutes, or until thickened. Stir in mushrooms and butter and season with salt and pepper to taste. Add chicken back to saucepan. Serve over Greek mashed potatoes and garnish with tarragon. Wash and cut the potatoes into large chunks. Bring a large pot of salted water to a boil. Add potatoes and boil for 20-25 minutes or until soft. Drain water. Using a potato masher, mash potatoes. Add Greek yogurt, butter, parsley and salt. Serve warm with tarragon gravy spooned over the top. Do you have a favorite recipe that used tarragon? This week, T coined me the 'Macaroni Maestro'. He thinks I should write an entire cookbook on ways to improve upon the standard box of mac & cheese. While I will admit that the creamy white cheddar shells with chopped basil and diced fresh tomatoes made for quite a delectable little dish alongside our garden-fresh salad for dinner one night, I hardly consider it a truly original recipe since the majority of it came from a box of Annie's Mac & Cheese (a yummy 'all natural' alternative to the old standby Kraft by the way). However, in a pinch, it does make for an excellent alternative to homemade. 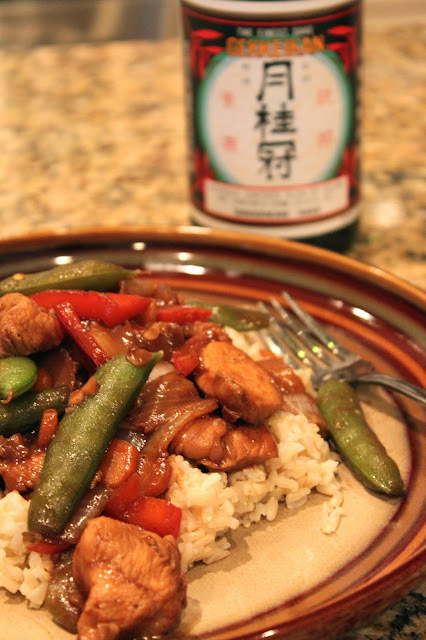 Speaking of homemade...doesn't this Asian chicken stir-fry with snap peas look yummy? When we moved, along with us came a bottle of sake. SAKE! And maybe a cute little sake carafe and glasses to go with. Therefore, the inspiration for this dish came from the need for some Asian flavors in our weekly routine. Everyone knows that sake goes best with Asian cuisine...or at least now you do! Also, I should probably mention the wonderful CSA box we had for week two. Step One: After gathering the ingredients, start the rice. Particularly if you are making brown rice, know that it takes longer than white rice. Get it started then chop up the veggies. Warm 1 Tbsp sesame oil in a large skillet then saute veggies for about 5 minutes until tender. Step Two: Meanwhile, put together the marinade. Add the chicken and refrigerate for at least 15 minutes to allow the flavors to meld together. NOTE: Notice I accidentally added the red bell pepper to the marinade. You should add it to the veggies instead. If you do like I did, never fear, it will still work out. Once the veggies are tender, remove to a foil covered bowl. Add the chicken (strained from marinade) to the skillet, cooking about 2 minutes per side. Step Three: Add the veggies and remainder of the marinade back to the skillet and continue cooking 8-10 minutes, or until tender and cooked through. Serve over rice. ASIAN CHICKEN STIR-FRY WITH SNAP PEAS | Yield: 6 servings | Total Time: 45 min. Bring rice and water to a boil in a saucepan over high heat. Reduce heat to medium-low, cover, and simmer until the liquid has absorbed and rice is tender. NOTE: Times will vary depending on type of rice you use - be sure to check your package - generally speaking, somewhere between 20-50 minutes. In a medium bowl, combine cornstarch, soy sauce, brown sugar; stir until smooth. Mix ginger, garlic, and red pepper flakes into sauce; coat chicken with marinade and refrigerate for at least 15 minutes. Heat 1 Tbsp sesame oil in a large skillet over medium-high heat. Add bell pepper, water chestnuts, snap peas, carrots, and onion stirring until tender, about 5 minutes. Remove vegetables from the skillet to a foil covered bowl and keep warm. Heat remaining Tbsp sesame oil in skillet. Remove chicken from marinade (use a slotted spoon), reserving liquid. Add chicken to skillet and cook about 2 minutes per side until slightly pink inside. Return vegetables and reserved marinade to skillet. Bring to a boil; cook and stir until chicken is no long pink, about 5-7 minutes. Serve over rice...and with Sake if you feel like it! BIRTHDAY CELEBRATIONS: Over July 4th, a reduced selection of my family was at the lake to help celebrate my Grandpa's 75th birthday! T and I had many headaches lots of fun searching around town to help track down the perfect gift to celebrate the occasion. What do you know...it was a complete hit. 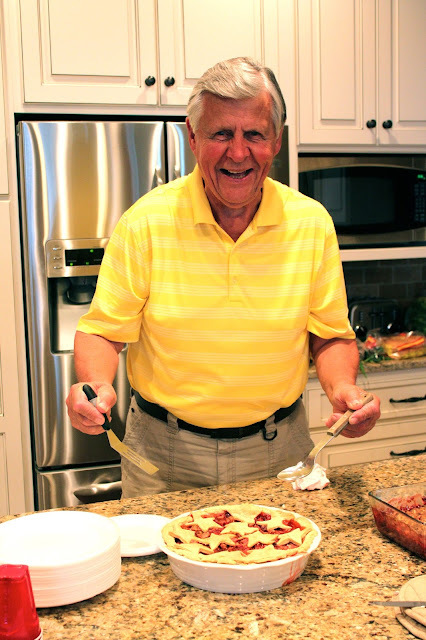 Also a hit, the strawberry rhubarb pie we made to top off the evening's celebrations. 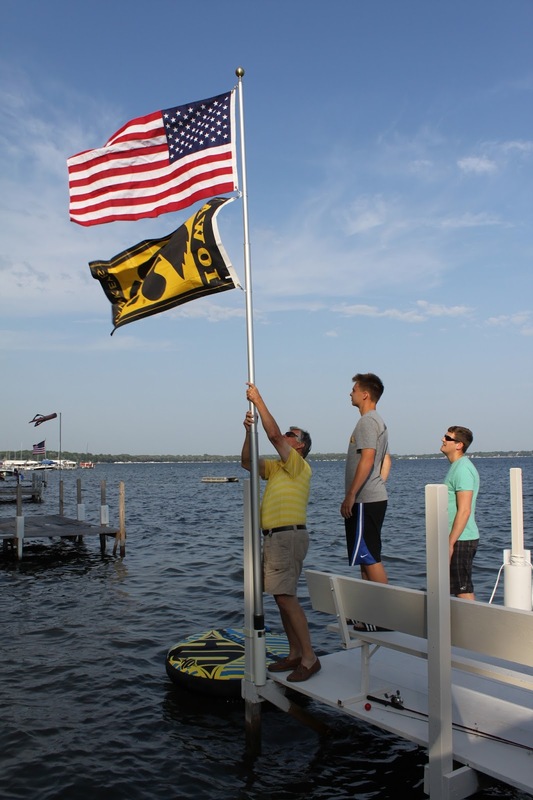 Grandpa attaching a new Hawkeye flag to the flagpole. Telescoping flagpoles on the end of the dock are so cool! 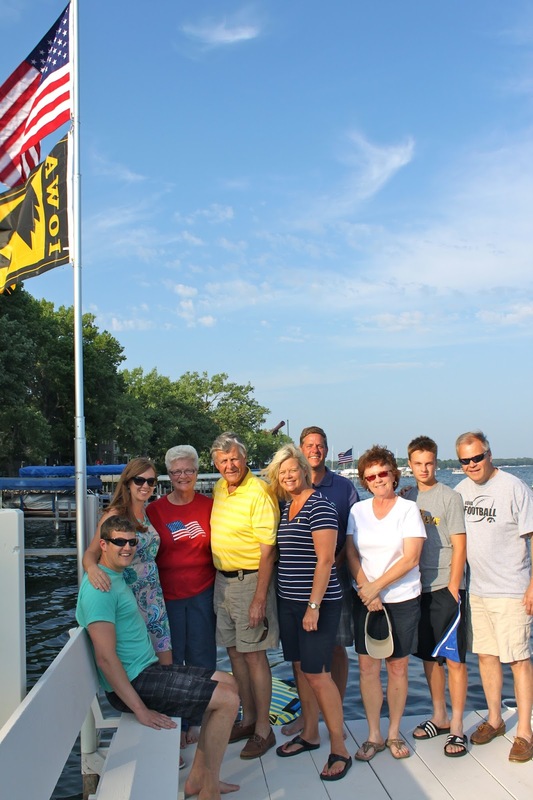 Some of the family celebrating Grandpa's 75th birthday at the lake. 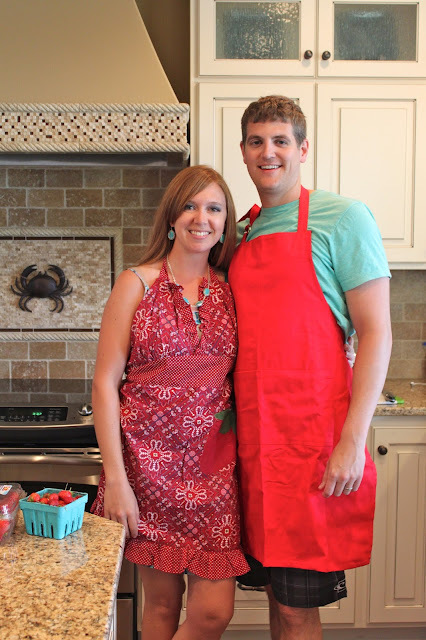 T and I spent the afternoon of July 4th whipping up a strawberry-rhubarb pie for the celebration. We even used fresh strawberries right from our CSA box. Yum yum. Looks like my Grandpa agrees! TURTLES: T has had a tremendous amount of fun watching the vast amount of painted turtles that call the area surrounding our current residence home. It has been an egg-laying week, and so far we've had the luck to spot 3 turtle holes being dug out for eggs. Can't wait to see if we can catch sight of the baby turtles once they hatch. 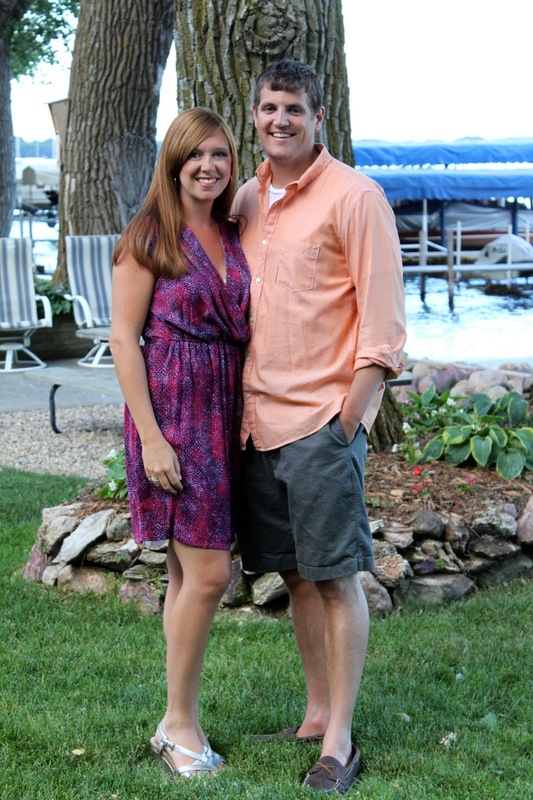 VISITORS: My brother N and his lovely girlfriend C catching some sun at the the lake. So good to see you two! Looking forward to our next night of cards. NATURE: On a more somber note...T has enjoying swimming in the lake the past few days, and discovered he has been unlucky enough to get swimmer's itch. YUCK. I asked if he somehow managed to get chicken pox, but after a day or two, the little welts have started to fade. Be warned! Make sure you are limiting your time in the lake, drying off and showering when you get out to help prevent this unfortunate circumstance. I'll spare you the pictures on this one! 1. MOVING DAY. Yes...Our state of residence has changed. Yeaaa!! We had a surprise phone call last weekend that our movers could come on a Sunday...lucky for us this meant we could get everything cleaned and hit the road sooner rather than later...no offense La Crosse, but I'll take a lake house location any day over a condo on the 'island' in the middle of the mighty Mississippi. Our belongings will be living in the garage of our new casa for the summer until we can completely move in. Seeing as our new residence is a total construction zone, we'll be spending our summer in limbo until expected completion in August. In the meantime, we enjoy checking in every day to see the progress. 2. LAKE HOUSE PROJECTS. The crew painting the dock. What. A. Project. It was nice to have several people helping to make the process less time-consuming and stressful. We finished up in about 2-3 hours. T thinks he could hire out as long as there is a beer involved as payment. We also helped my grandma to get some new mulch and flowers to spruce up the landscaping for the summer. 3. NEW BIKES. Soooooo exciting. T & I have been considering investing in new bikes for a long time. After getting fed up of hearing the constant "walking is sooo boring" or "walking isn't a workout", (not true at all by the way), we are now officially proud new owners of not only bikes, but also snazzy new bike helmets to help keep us safe. If you know T's track record, safety for new toys that move fast is a must. 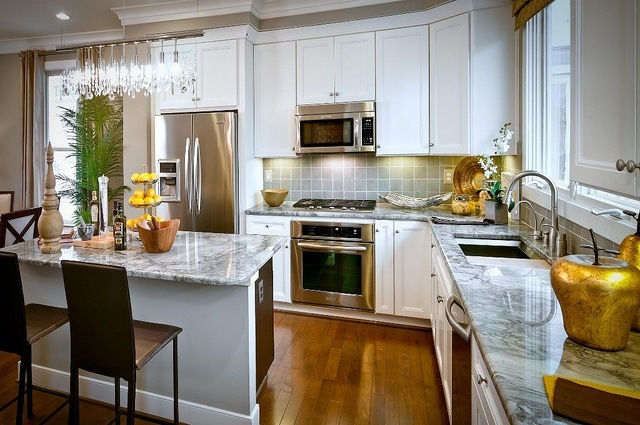 NOTE: This is not our kitchen, just an example of what the countertop will look similar to. 4. COUNTERTOPS. Just when you think you have it all figured out...We got a call that the countertop we chose for our kitchen island was not going to be large enough to be a single solid piece, and would need to have a seam to make it work. Not too crazy about that idea, we made a trek to the granite store to see what our choices were. Good news...we found a completely different option that has a more marbled look that we like even better for our new home.